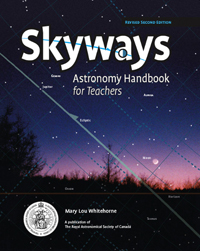 Skyways, the RASC's Astronomy Handbook for Teachers was written specifically for Canadian educators and meets the astronomy learning outcomes outlined in the Common Framework of Science Learning Outcomes (the "Pan-Canadian Protocol"). The book contains instructions for hands-on activities on a wide range of topics including Seasons, Stars, and the Solar System. Explorons l’astronomie – Guide pédagogique.